Rep. Martin Causer speaks in support of independent oil producers at a press conference at the Drake Well Museum in Titusville. Hosted by the Pennsylvania Independent Petroleum Producers, the event highlighted challenges threatening the future of this 150-year-old industry. TITUSVILLE – Reps. Martin Causer (R-Turtlepoint) and Kathy Rapp (R-Warren) this week joined hundreds of independent oil producers and supporters at the world’s first oil well to highlight the challenges threatening the future of this 150-year-old industry. 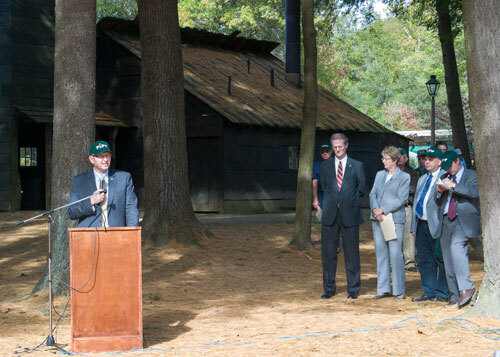 Hosted by Pennsylvania Independent Petroleum Producers (PIPP) at the Drake Well Museum in Titusville, the event was designed to send a message to Harrisburg that regulations geared toward large-scale unconventional wells are not only unnecessary for shallow well drillers but may well be the industry’s death sentence. PIPP President Gary Hovis led off the event by highlighting the differences between drilling conventional and unconventional wells. Because conventional wells can be drilled more quickly and require less ground area, water and truck traffic, Hovis said the state Department of Environmental Protection (DEP) should develop a separate set of regulations for unconventional wells and allow conventional wells to continue operating under current regulations. Former Congressman John Peterson, who served as emcee at the event, reiterated the call to separate shallow well drillers from the large-scale drilling in the Marcellus Shale saying that northwestern Pennsylvania cannot afford to lose one more job to state policy. Hovis and Peterson were followed by more than a dozen speakers involved in various parts of the oil and gas industry, each sharing their stories of how state regulations have increased operating costs, decreased production and threatened the future of their livelihoods. The speakers ranged from fourth and fifth generation operators to students at the Warren County Career Center Gas Program. 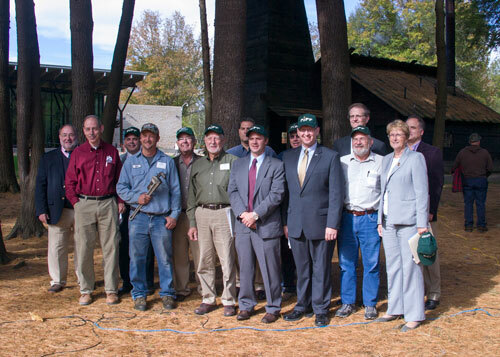 Rep. Martin Causer was among more than a dozen speakers at a press conference hosted by the Pennsylvania Independent Petroleum Producers (PIPP) at the Drake Well Museum in Titusville. The event was designed to send a message to Harrisburg that regulations geared toward large-scale unconventional wells are not only unnecessary for shallow well drillers but also may result in the downfall of the industry.